Everything has an end, even childhood. What happens if we start sinking back into childhood to protect ourselves from the cruelty of the world and from death? If we start cheating and harassing those close to us in the name of a sense of security? The dark sides of Swedish-style welfare and individualism have always been Ingmar Bergman’s object of interest. His last work Saraband also examines the background of relationships of dependence and explores the boundaries of love and the desire for possession. 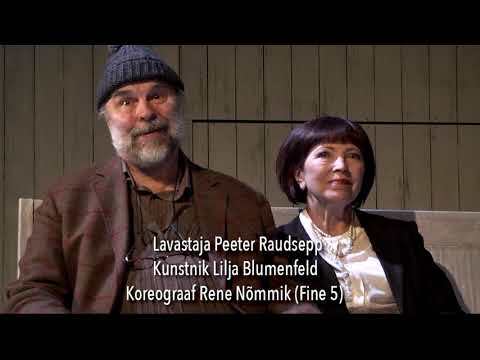 Thirty-two years have passed since the characters Marianne and Johan from the play Scenes from a Marriage last met. Their new meeting at Johan’s home among the forests of Central Sweden introduces new characters and cruel passions. This drama inspired by Bergman’s own experience of mourning is a very refined glance into the depths of the human soul, where memories, love and hate form strange and fragile patterns. Premiere: 19 February 2017 in the Small Stage. Cast Kersti Kreismann, Martin Veinmann, Ester Kuntu (guest), Jaan Rekkor.